Sophisticated masking and motion tracking tools let you follow moving objects precisely. You can easily “pin” text to them or apply color grading, special effects, and other video filters as those objects move through the scene. Sophisticated and flexible masking technology coupled with rock-solid motion tracking give you the ability to isolate moving objects in your scene. You can easily track their motion and “pin” text to them or apply color grading and other creative effects that follow them wherever they go. Integrated motion tracking developed by the VEGAS team specifically for VEGAS Pro provides lock-tight tracking results. Save time! Files don’t need to be added one by one anymore. You can now drag media bins (which also include the new storyboard bins) directly to the project timeline to add all of the bin’s media files simultaneously. With the powerful, flexible Bézier masking plug-in, you can create up to five different masks, choosing from oval, rectangle or custom shapes. These can then either cut a section of the video out to reveal different video beneath, or have an effect applied within them – such as color grading or blur – making it possible to blur someone’s face while leaving the rest of the video in focus. Tied in with the new motion tracker the mask can move along with an object during the course of the video. Give your videos that Hollywood look! With just a few clicks, you can add the atmosphere, feel, and look of famous films, movie genres, film stocks, or particular movie-making eras to your video. Take your viewers on a journey into a whole new realm. Enjoy 100 effects from proDAD VitaScene LE (worth $199). A high-quality plug-in featuring many keyframeable effects and transitions. These include light and mood filters and paint effects to turn your films into a high-contrast “watercolor” paintings or drawings. There are also restorative plug-ins to help you salvage old or corrupt video and more creative tools such as the popular tilt-shift “mini city” effect. 700 effects from proDAD VitaScene. The full version of proDAD’s (worth $599) incredible suite includes around 700 effects ready to use for a huge number of purposes: from restoring video to spectacular visuals. You get light and mood filters, paint effects, and incredible movie effects, light rays, glows, glimmers, and glitters. All are available as transition effects and video filters for your video material, texts, and graphics. VEGAS Pro 16 supports S-Log and other advanced color space technology so you can take advantage of the wide color spaces of the most modern video cameras from all manufacturers. Tiny Planet videos have grown in popularity and quickly captured people’s imagination by allowing you to create an effect where a subject appears to be standing on a super-small planet. The VEGAS Pro Tiny Planet OFX plug-in is the easiest and most elegant solution to create this popular effect and includes effect animation and integration with regular or 360º videos. 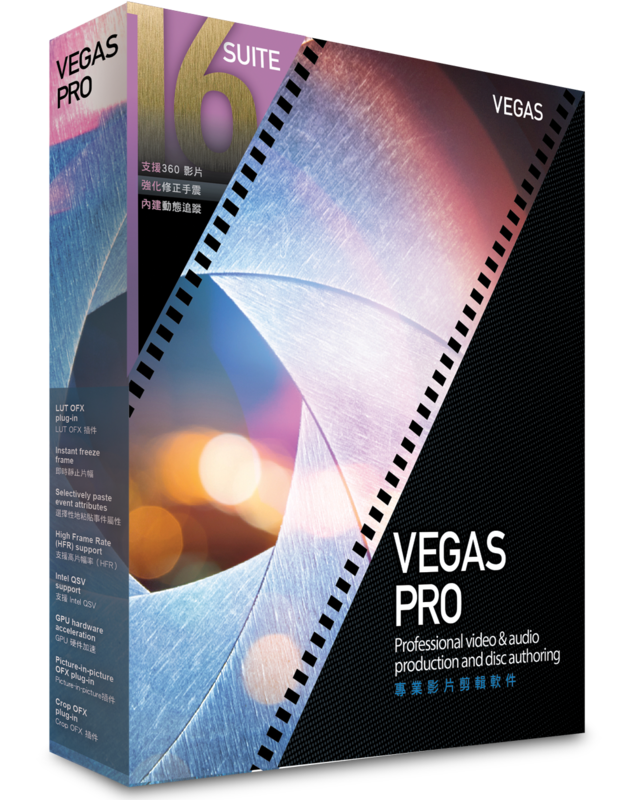 VEGAS Pro 16 includes MAGIX’s renowned high-quality Essential eFX audio plug-in suite: a great-sounding and very flexible set of tools for shaping and mastering audio. It includes plug-ins for improving the quality of the speech and music in your soundtrack, reducing any noisy elements or adding quality special effects like delay, reverb and chorus. Enjoy 100 effects from proDaD VitaScene LE A high quality plug-in featuring many keyframeable effects and transitions. These include light and mood filters and paint effects to turn your films into a high-contrast ‘watercolor’ paintings or drawings. There are also restorative plug-ins to help you salvage old or corrupt video and more creative tools such as the popular tilt-shift ‘mini city’ effect. The full version of proDAD’s incredible suite includes around 700 effects ready to use for a huge number of purposes: from restoring video to spectacular visuals. You get light and mood filters, paint effects and incredible movie effects, light rays, glows, glimmers and glitters. All are available as transition effects and video filters for your video material, texts and graphics. ü Internet connection: Required for registering and validating the program, as well as for some program functions. Program requires one-time registration. VEGAS Pro 16 offers the exact software version you need. All VEGAS Pro versions have one thing in common and that’s that they offer incredible performance for the highest demands in video editing. Learn about the most important features in each version to find which one is right for you.